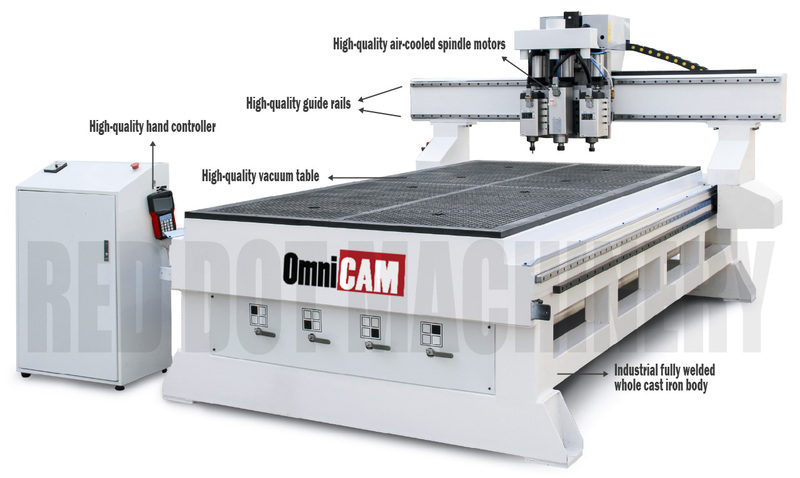 Superior industrial-grade CNC Router that can be used for sign making, furniture making, cabinet making, mold processing, art crafts creation, etc. These machines can do on metal sign plate, stainless steel plates, copper or zinc mold, aluminium, wood, marble, and much more. Superior industrial-quality machine with high precision and reliability without high price tag! Turn your creative design into reality! DSP (Digital Signal Processing) Controlling System. High precision and high speed machine. Three 3kW air-cooled spindle motors, very powerful and quiet. Machine has automatic tool height adusting device. Machine is capable to work without computer. Machine is capable to resume work since power goes off. Plug in the machine to an USB port. Machine is capable to save up to 30 processing files simultaneously. Adopts linear and adjustable bearing device in X, Y, Z direction, assuring no gap between slide parts of bearing and linear. Whole cast iron body, milling surface, very stable when working for a long time. Adjustable speed, curve line and straight line speed are controlled independently. Matrix table structure with installed vacuum table. We supply parts at low prices anytime when you need them. If you would also like to purchase a PC that has been set up to work with this router, please let us know. As New working and physical condition (Complete and ready to use). The machine has been used very lightly a few times for a total of approximately couple of hours for demonstration purposes. We could sell this machine as brand new but we would prefer to do business in honest ways. 2 year warranty from us (excludes consumables, such as router bits). We supply all parts at low prices anytime when you need them. If you would also like to purchase a PC that has been set up to work with this machine, please let us know. We dispatch any machine anywhere in Australia. Freight is calculated based on your dimensions, weight, and destination suburb and post code. No forklift? No problem at all. A lot of our customers do not have forklifts. We are able to organise delivery either by a HIAB/Crane truck or tailgate truck with pallet jacks. Pickup in person is also available by appointment only. Not sure if this machine can engrave/cut particular material(s)? If you are not sure whether this machine is capable of engraving/cutting particular material(s), we are more than happy to test it for you for free. Please email us with your enquiries, you are more than welcome to send the material(s) to us for testing.